There’s spring in our step here at Waterways with a handful of exciting announcements and developments on the horizon. 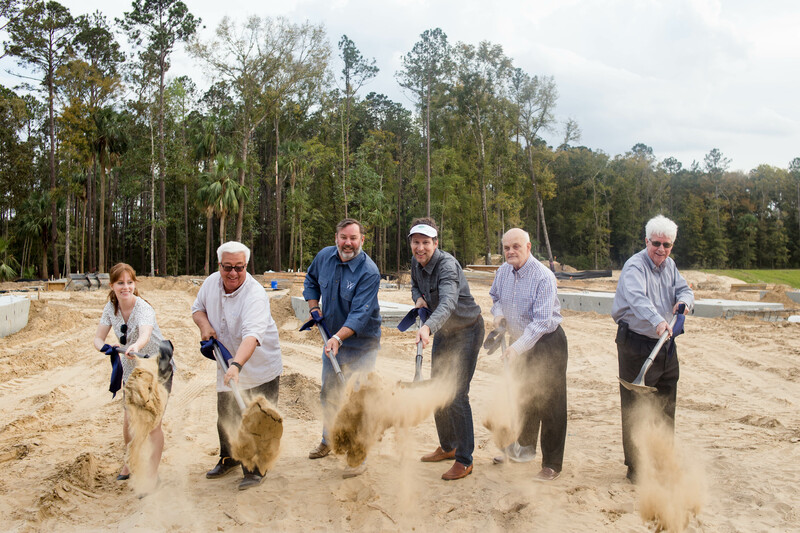 From pouring concrete for the drystack storage facility at Waterways Marina, to the soon-to-debut Waterwags Dog Park, there is a lot to look forward to this year! Marina Village is officially underway with the drystack storage facility planned to open this fall. There, we will welcome nearly 200 boats up to 35 feet. Head home after work, hop on your boat, and be in the Atlantic in a matter of minutes. Pets are part of the family here at Waterways, and we pride ourselves on the fact that Waterways is a great place to explore nature... whether you have two legs, or four! With this in mind, we are overjoyed to announce that we are in the process of creating a Dog Park here at Waterways so that our resident pups can run and play with their neighbors and furry friends. Waterwags Dog Park is planned to span the large, wooded area across from the Ridgewood Pool House on the main entry road. The park is almost ready for some puppy love... stay tuned! Things are always moving here at Waterways – including residents! Whether you’re moving in or around the community, we chatted with resident Donna Ward – also known as The Moving Maven – about her personal moving assistant business and her time as a Waterways resident. Moving can be a drag, making The Moving Maven the ideal neighbor for any of your needs within the community. They can help pack and unpack, oversee movers on moving day, organize and declutter, donate unwanted items, stock your fridge and more. If you’re new to Richmond Hill, The Moving Maven will even give you a tour of the area, share recommendations for doctors, dentists and caregivers and even help with school registration – all in an effort to de-stress the process of moving. Witnessing the popularity of growing Richmond Hill, Donna saw an opportunity to provide a helping hand – especially for military, seniors and working couples – and decided to start her business. Donna and her husband, Ron, moved to Waterways in April 2017, drawn in by the distinct character and charm. “To us, the best part of living here is the natural beauty of everything that has been kept and maintained and the amount of green spaces that allow so many outdoor activities,” says Donna. In her downtime, Donna can be found exploring the outdoors with her dog, Gus. 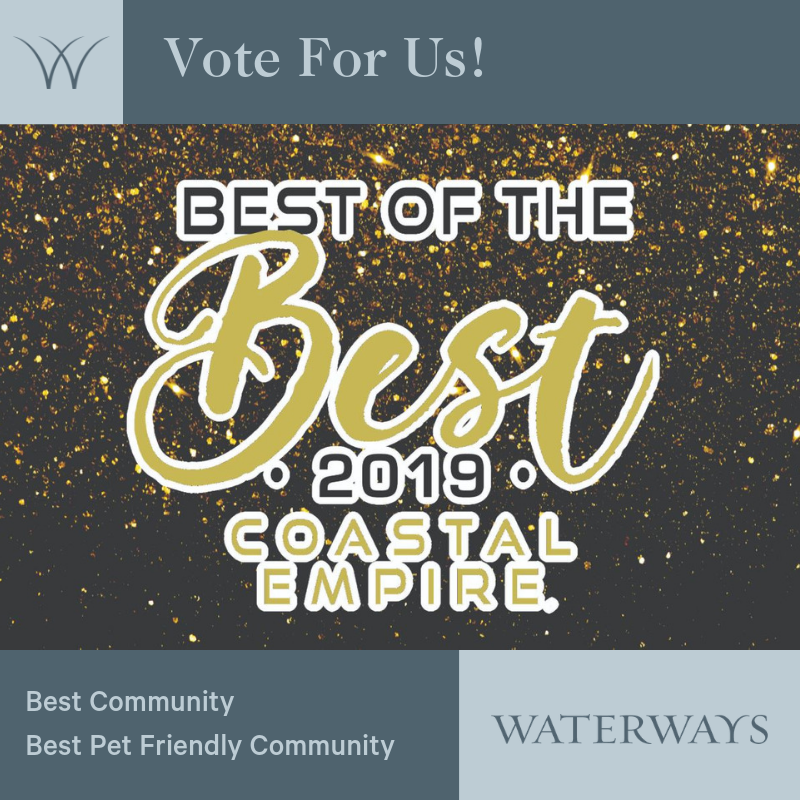 Last year, we were honored to be voted the Best Community and Best Pet Friendly Community of the Coastal Empire in Savannah Morning News’ annual Best of the Best contest. With that… help us hold our title! We’ve been nominated again for both Best Community and Best Pet Friendly Community. Today is the last day to vote, so vote here! Discover your dream home at Waterways, a master planned community that's rooted in nature and built with modern amenities. Please join us this Sunday, March 24th from 1pm to 4pm for a glimpse at the southern charm and gorgeous natural setting of this place that's made to be explored. Not one, but TWO stunning homes in the Long Creek neighborhood of Waterways will be open for viewing. - Stop by our Waterways Sales Center to learn the latest news about Waterways Marina: coming this fall! - While you're here, REGISTER TO WIN a $250 Visa Gift Card! Nature Walk, Saturday, April 13, 10-11 a.m.
Easter Eggstravaganza, Saturday, April 20, 10 a.m. - 12 p.m.
Spring Community Wide Yard Sale, Saturday, May 4, 9 a.m. - 1 p.m.
Get healthy with your neighbors! Fitness Fusion is a one-hour bootcamp-style class offered to residents by certified personal trainer Angie Martin. The class is held in the Ridgewood Fitness Center and incorporates a variety of exercises to help you stay in shape and meet new goals. Every class is different, so you and your muscles will never get bored. Fit for all fitness levels and ages. 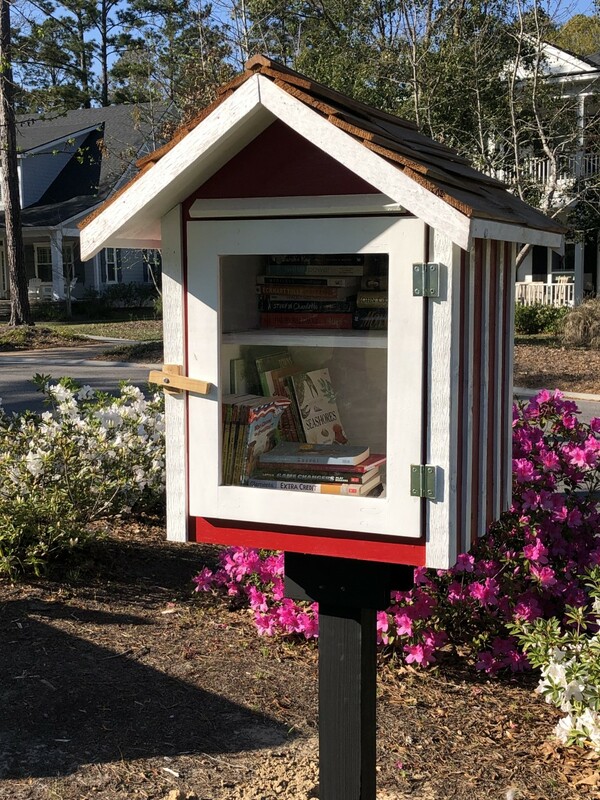 Waterways has joined the Little Free Library Movement! A group of Waterways residents got together to design and build a Little Free Library in Trellis Park. The library houses books for residents of all ages to choose and enjoy, and we are already seeing residents stopping at the library - whether they are couples on their morning walks or children getting off the school bus. We are thankful for the residents who worked to make this idea a reality for our community! With more than 30 years of experience, Elmgren’s Services and Garden Center offers a variety of residential and commercial landscaping and lawn care services, from a fully stocked retail garden center in Richmond Hill to private, high-end residential and commercial projects. With the Garden Center carrying a fully-stocked plant nursery, Kamado Joe grills, wood furniture, patio décor and the Photopoint Gallery, local residents can also look forward to The Produce Place, a local fresh vegetable and fruit market – opening in April! Make sure to follow us on Facebook and Instagram for the latest news and happenings.